Young girl in sausage curls | Who Were They? 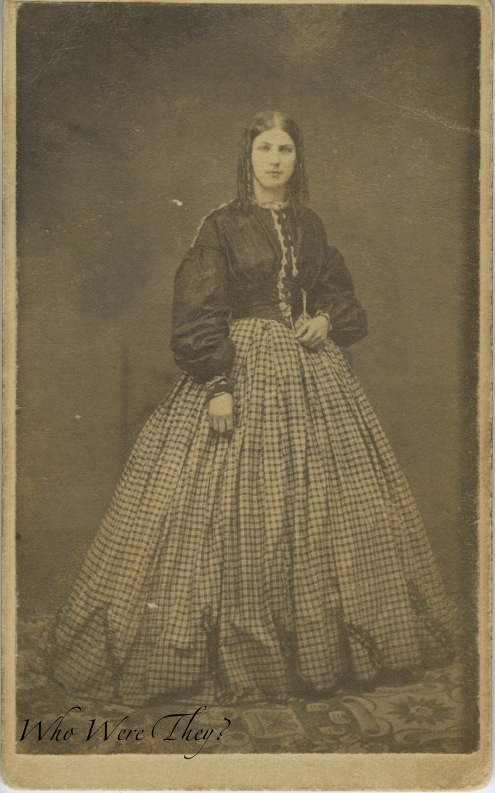 I particularly love this photo of a young girl taken during the 1860s. At first blush, it gives the impression that she doesn’t have much – her skirt and blouse do not match, the skirt drags on the ground on one side and is high on the other, little details. But, after I scanned and enlarged the image, I see that her bodice has trim on the cuffs, across the shoulder and down the front that likely coordinated with the skirt fabric. Also, the skirt has a deep chevron shaped trim at the hem, which was generally eschewed because a. trims were expensive and b. you need a lot to trim a skirt that could be 150″ circumference! For the math-challenged, that is 12 1/2 feet at the hem. I suspect this style of solid colored bodice to plaid skirt was on trend for her peer group. The town she was presumably from – Skaneateles, NY – is quite small even today with only about 2500 citizens. It is in the Finger Lakes area of central New York state. Apparently it had a large Quaker population at some point. 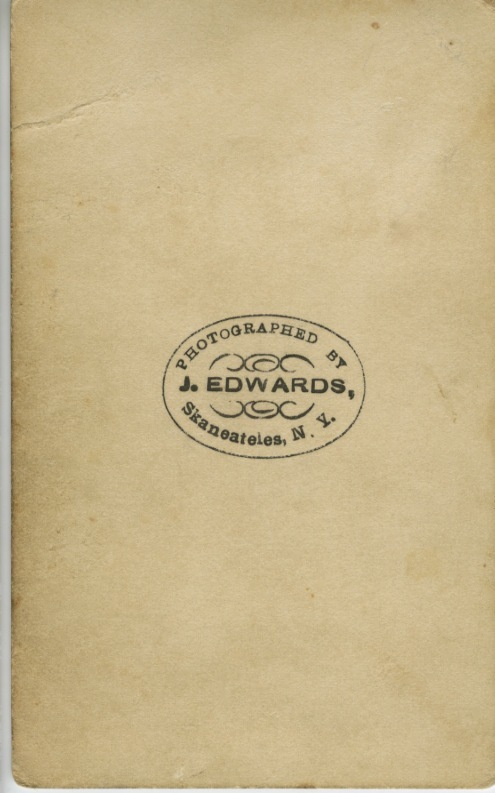 The photographer was – to the best guess I can make – Johnathan Edwards, who was listed on the 1860 census as an artist in Skaneateles. I have sent a message off to the Skaneateles Historical Society to determine of they know anything more. UPDATE: Fabulous, I heard from Beth at the Skaneateles Historical Society who confirmed the photographer was in fact Johnathan Edwards. Hurray! Edwards was born April 18, 1826 and was the son of Thadieus Edwards. As a child he learned painting, and later became a daguerrian artist in the 1840s. This evolved into photography and he had a gallery in Skaneateles until 1870s. At that time, he sold his business and retired to be a farmer (some relaxing, right?). However, he must have missed his true calling and went back to painting in 1875. He continued at that until he died August 25, 1900. He and his wife Angeline Aldridge had been married 50 years by that point. They had a daughter and a son. Edwards outlived his siblings (4 brothers, 1 sister) and is buried in Lakeview Cemetery in Skaneateles. Also during the course of his life, Edwards had been a constable and deputy sheriff for the village. Thank you again, Beth! I hope they get back to you. I love a good mystery but I love a good solution even more. I bet the skirt trim matched the bodice. I am challenged by dresses but not by carpenter’s math. A “diameter” of 12 feet 6 inches seems most unlikely, as that width of dress, hoops and all, would never fit through a doorway! Perhaps you mean “circumference”? If this girl’s hem was 150 inches around, it would make a 4 foot diameter, which though still large, seems about right for her height. Oh my gosh you are right! Haha it’s the circumference.